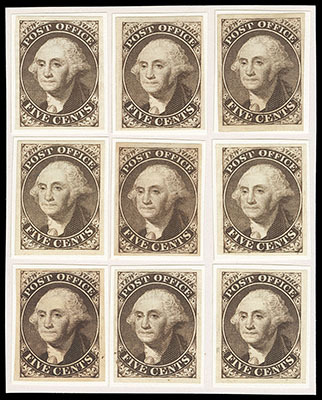 New York, N.Y., 1845, 5¢ brown, trial color plate proof on bond, complete set of 9 positions from the sheet, mostly large margins, rich colors, Very Fine and scarce trial color sheet reconstruction. 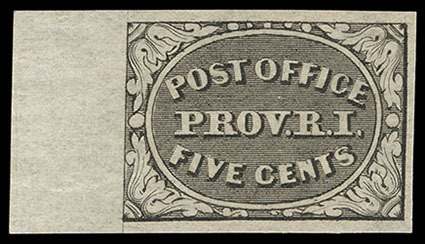 Providence, R.I., 1846, 5¢ gray black, left margin single (position 4), o.g., never hinged, large well balanced margins, crisp detailed impression, Extremely Fine, very scarce in never hinged condition; with 2001 P.F. certificate. Scott No. 10X1 $350 for hinged. 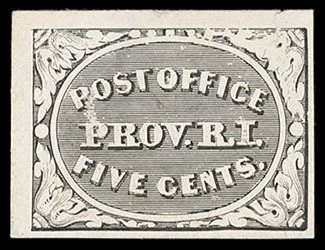 Providence, R.I., 1845, 5¢ black, plate proof on card, full to huge margins, bright shade, scuff at left and tear at top, otherwise Very Fine.